Welcome home to Casa Granada. 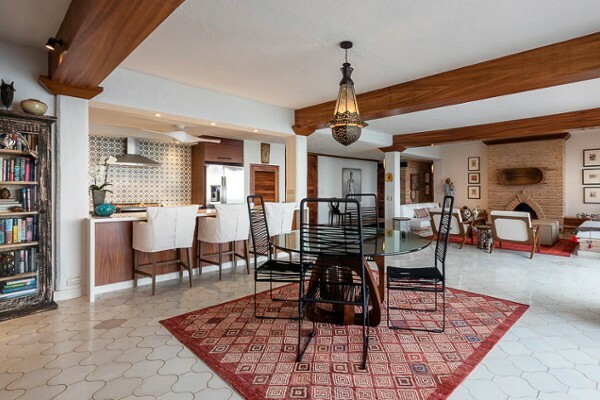 Extensively renovated in 2017-18, this exquisite two bedroom, two bath Amapas condominium skillfully blends original Spanish Moorish details from Puerto Vallarta’s golden age with contemporary Elle Décor style, creating a casually elegant Mexican beach home to cherish for a lifetime. 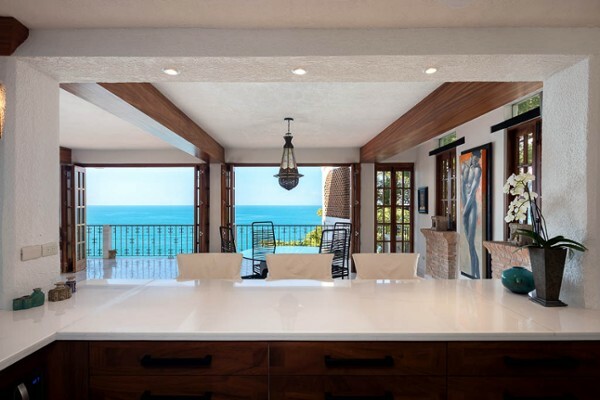 Enter at cobblestone street level to the home’s grand open-plan living space with breathtaking Pacific Ocean vistas. The light-filled chef’s kitchen features high-efficiency Io Mabe stainless steel appliances: double door refrigerator, gas range, range hood, dishwasher, built-in microwave and garbage disposal. 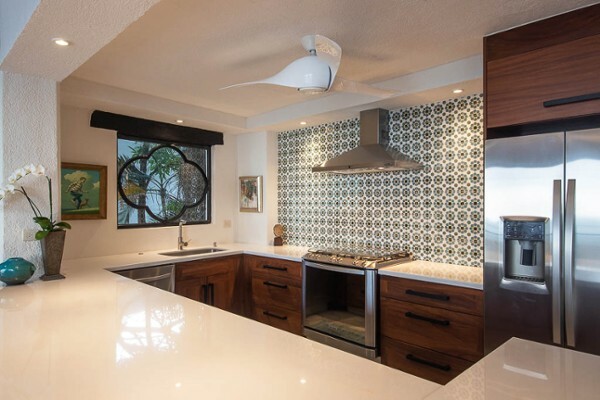 Rich custom Parota wood kitchen cabinetry and Mexican Carrara marble countertops combine with a Moorish tile backsplash and iron quatrefoil window to dramatic effect. The living and dining areas showcase an original working fireplace, locally-made vintage tile floors, Moroccan chandelier, breakfast bar, bespoke Parota wood beams, transomed French windows and a 36’ wall of handcrafted bifold doors opening to the balcony. 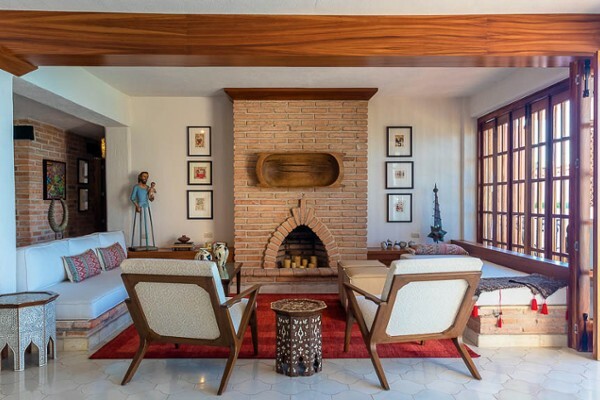 Beautifully decorated, the home’s one-of-a-kind, custom-made furniture was created by Mexican designers, artisans and craftsmen. Perched above Los Muertos Beach’s iconic Boy on the Seahorse sculpture, the open-plan living space and both bedrooms flow to the 65’ ocean-facing balcony. Savor the morning ballet of the swallows with your first cup of coffee. Delight in Humpback whale watching on the shimmering sea. Revel in extraordinary sunsets with an evening margarita. Your friends will slumber to the sound of rolling waves in the inviting guest room. The stylish guest bathroom showcases captivating Mexican tiles and a Parota wood and marble vanity. Featuring a custom designed Carrara marble sink, French-drained Moroccan-themed shower and unique iron accent window, the master bath is not easily forgotten. The generous master bedroom offers the perfect escape for enjoying starlit skies, thrilling fireworks across Banderas Bay and wonderful views of Playa Los Muertos Pier. 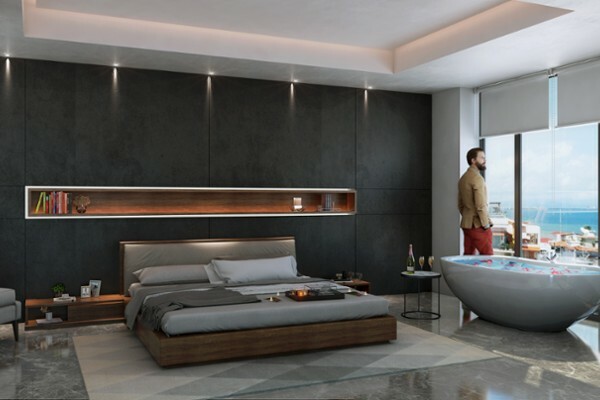 Vallarta Manor boutique condominium features an enticing swimming pool and Mexican-tiled terrace for outdoor entertaining, building maintenance, professional management and first come first served garage parking. 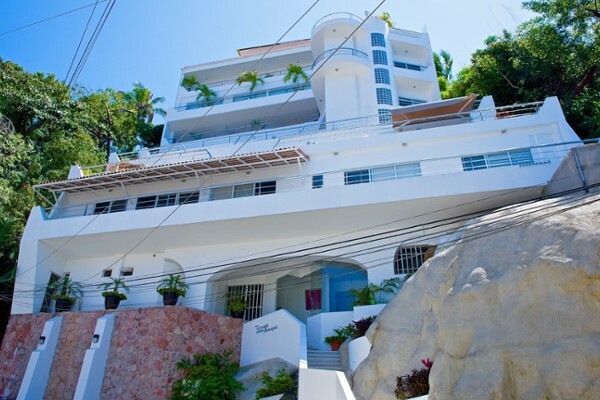 Stairs alongside the condominium take you directly to legendary Los Muertos Beach. 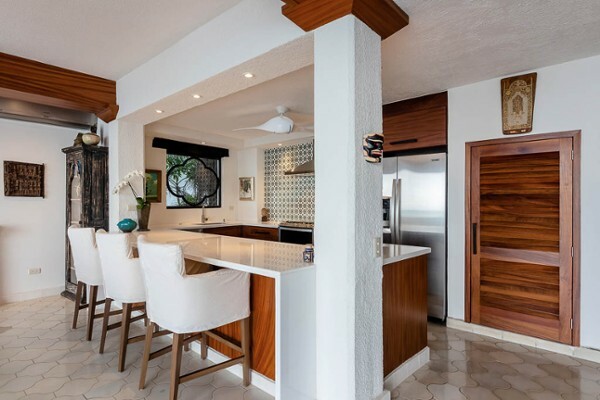 Casa Granada’s coveted Calle Santa Barbara location is a short stroll from all of Zona Romantica’s renowned dining and entertainment selections. With new electrical and plumbing systems, Whirlpool energy saver inverter ductless air conditioning, UV drinking water purification, instant hot water, water pressure booster, LED lighting and Whirlpool high efficiency washer and dryer, this truly unforgettable move-in-ready seaside home is not-to-be-missed. This huge Amapas hillside condo features two bedrooms, 2.5 bathrooms, elevator acces.. 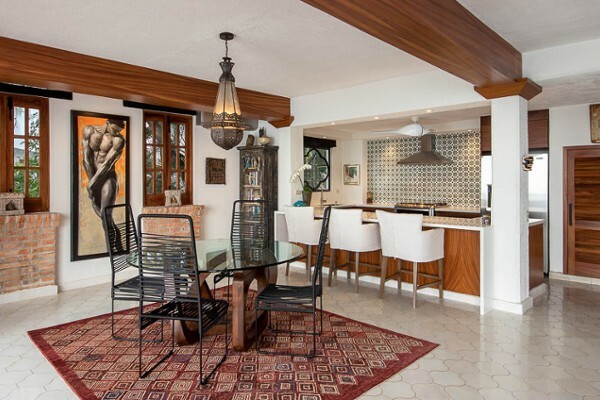 Sitting side by side on the hills surrounding Puerto Vallarta's southern boundary, Amapas and Conchas Chinas are upscale residential neighborhoods with both upper and lower sections, as divided by the Carr. 200 South highway. 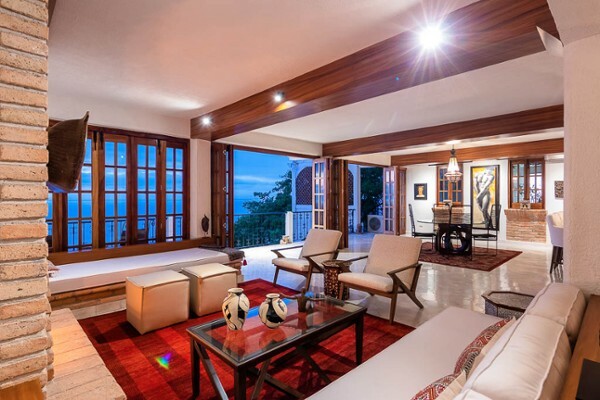 Here, traditional Vallarta-style villas and modern condominiums sit next to each other, sharing a spectacular view of Banderas Bay, in the case of those located high up on the hill, or within walking distance to the beach, or direct access to it for the lower sections. What makes the area exceptional are the amazing views. There isn't much in the way of shopping or restaurant opportunities, that all happens down below in downtown Vallarta, so in most cases you'll need a car. Here, you can enjoy peace and quiet with panoramic views of the bay, with all that Vallarta has to offer just minutes away.